Here is one of my favorite salads deconstructed into an appetizer. Too often when we hit the holiday parties, veggies are MIA on the buffet table. 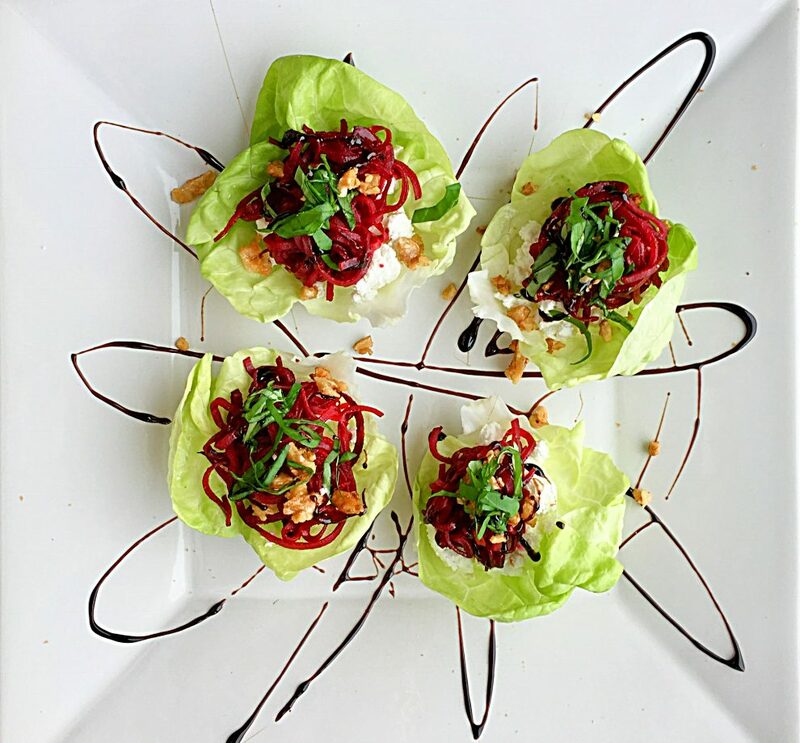 Spiraled Beet and Goat Cheese Lettuce Cups has holiday written all over it and it’s what you bring to fill the veggie void. You’ll feel good about contributing something fresh and amazing to the table and because you have something to eat, there’s no need to compromise on your health/clean eating goals. Choose a butter lettuce head, or two. Take it apart to find the small leaves. Your shooting for bite size lettuce cups. Reserve the bigger leaves and the teeny leaves for a dinner salad. Wash and pat dry lettuce leaves. 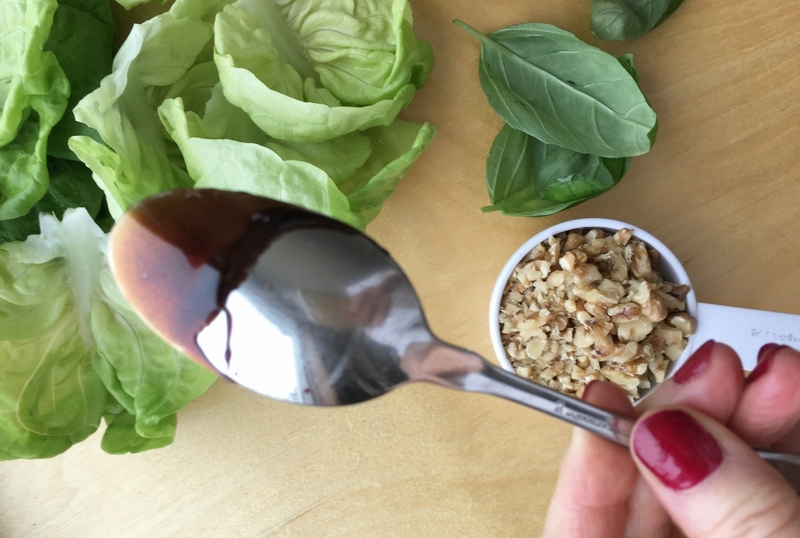 You can make the balsamic reduction ahead. It’s done correctly when a spoon is dipped in and comes out coated like this. 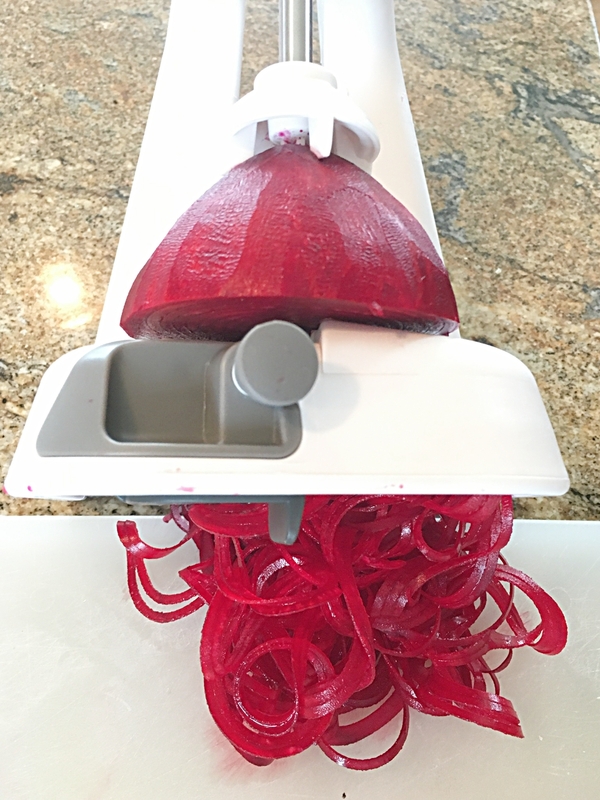 I’m trying out this new spiralizer with intact blades, uses more of the veggie than the Paderno Spiralizer, has some built in safety features, and it’s is dishwasher friendly. The local culinary gift shop The Kitchen Engine carries it as well as Amazon. Lay beet spirals out on a rimmed baking pan, season and roast for 15 minutes. Pictured are 3 spiraled beets, which is more than is needed for this recipe. Bonus: the leftover roasted spirals are added to green salads. Once these are done, quickly roast the walnuts as per the recipe and construct these beauties. Serve them on a white tray so the colors pop! Preheat oven to 400 degrees. Prepare a rimmed baking sheet with parchment paper. Set aside. While the oven is heating, start the balsamic reduction. Combine balsamic vinegar and maple syrup in a small saucepan. Bring to a low simmer and cook uncovered for 15 – 20 minutes until thickened and reduced to half the amount that you started with. Let cool. Transfer to a small bottle with a narrow nozzle for drizzling. 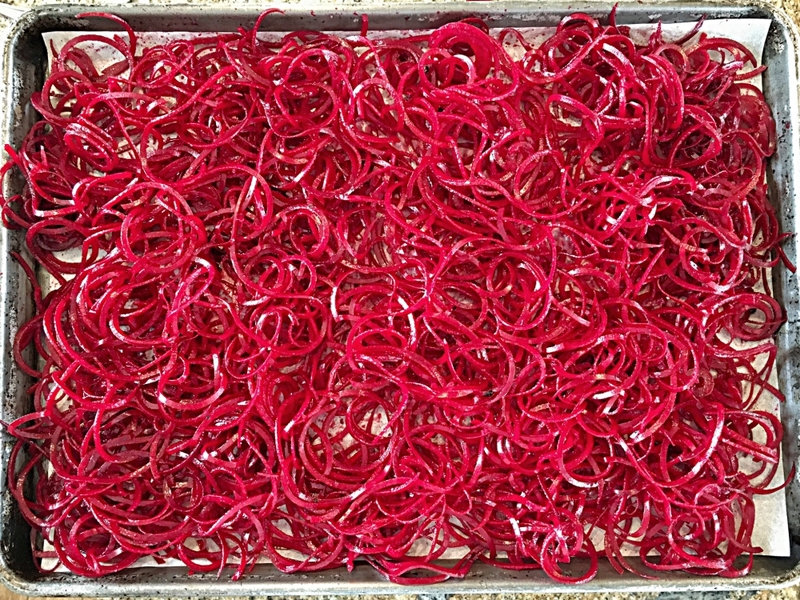 Spread spiraled and trimmed beets on prepared baking sheet, drizzle with olive oil (1-2 tablespoons) season with salt and pepper and bake for 15 minutes. Remove from oven, turn heat down to 350. Transfer beets to a plate to cool. Line the same baking pan you roasted the beets in with another sheet of parchment paper. Spread chopped walnuts on baking pan, drizzle with one tablespoon maple syrup, sprinkle with a healthy pinch of sea salt, and toss. Roast for 7-8 minutes, or until walnuts smell fragrant. Be careful here…these are too easy to burn. Now you’re ready for construction: On a large white platter drizzle a balsamic glaze in a starburst pattern. 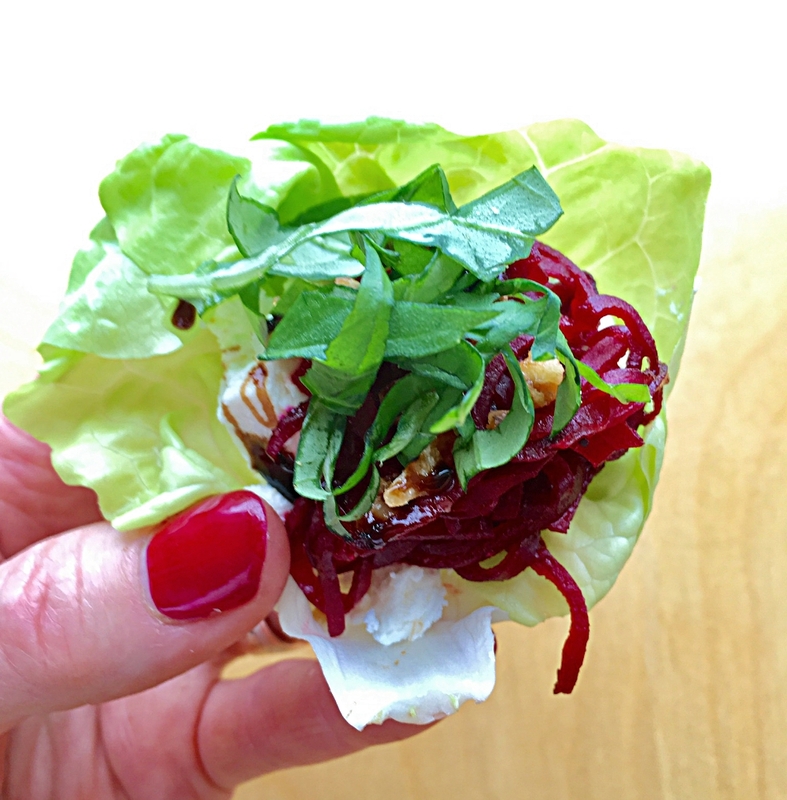 Distribute goat cheese evenly in each lettuce cup. 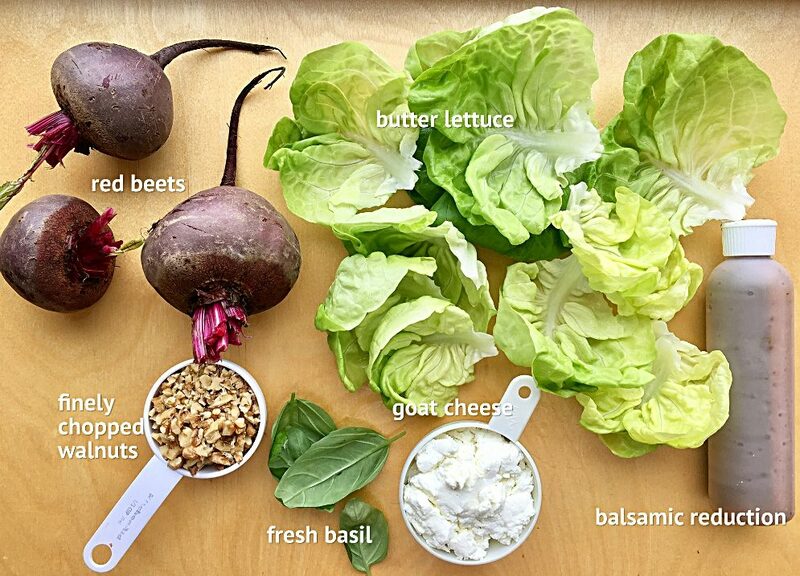 Top each lettuce cup with about 2 tablespoons of spiraled beets. Lay lettuce cup on tray. Sprinkle all over with toasted walnuts. 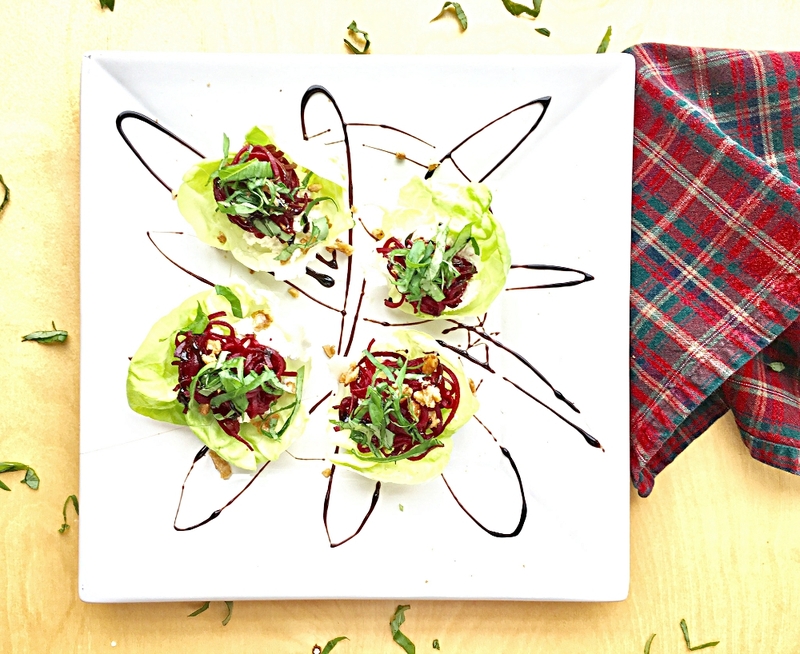 Give lettuce cups another drizzle of balsamic then garnish with fresh basil. Yum!